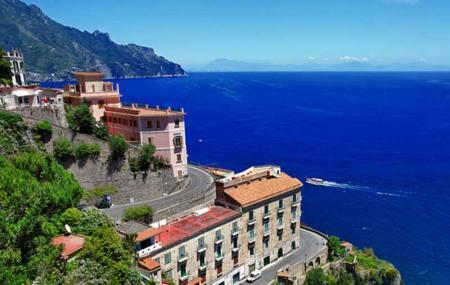 Explore smallest city in the south of Italy on a day’s trip while at Amalfi. Founded by Romans, it was home to the richest and most powerful people in Amalfi, leading to a long prosperous era of the city until the time of Pisani invasion. The city doesn’t experience a lot of crowd even during the peak season as it opens only to the beach. Atrani offers a beautiful hike trail apart from charming cafes and bars which have recently become the most favorite meeting place of the locals and a perfect place for the visitors to sit and watch the world go by while sipping on coffees or their favorite drink. Best time to visit Atrani, like its neighbouring cities, is anytime during the year. Although the peak season is from June to August. Drive down or hop onto SITA bus. People normally club together Grotta Dello Smeraldo and Minori while planning their visit to Atrani. Our magical Amalfi Coast wedding was made all the more perfect by Bruno's voice and repertoire. He captured the essence of our intimate and romantic celebration with soft acoustical music and his beautiful voice. He was respectful of the hotel venue at the Wagner Gardens all the while making sure our experience was everything we hoped it would be. And it truly was everything we could have imagined and more! You can see Bruno truly loves what he does and takes great pride in his work. We were thrilled with his performance and highly recommend him! My husband and I recently used Bruno for our wedding reception music. Bruno was a pleasure to work with. From our very first email till the music on the wedding night, Bruno was professional and accommodating to all our requests. Bruno really did do all he could to ensure the wedding music was as good as it possibly could be. If you want peace of mind that your wedding music/reception will be great, you should 100% use Bruno!! Thanks Bruno! Becky and Terry Hards. Bruno worked magic during our wedding weekend on the Amalfi Coast in June 2014 - I don't even know where to start thanking him. We had slightly unusual requests and yet he and his team were the utmost professional musicians and performers. Our welcome evening was in a Norman Tower on the coast with an alien theme. He helped me find a performer to suit this theme - a fire-eating, stilt-walking, performer who delighted our outer-worldly guests on the beach in the night with the waves crashing beside us. This was followed by a trio of tarantella dancers, a specialist dance local to this region. On our wedding day, Bruno arranged for us to have a wonderful string quartet with two tenors, except that they had to hike a 10 minute path along the mountains next to Ravello to reach a secret place on a cliff-top that we found for our ceremony, and the two tenors sang a song that I transcribed with less than a week's practice. I am in awe of what Bruno achieved for our wedding, always with a smile and so supportive. Thank you thank you thank you! !